Quiet and sunny position near Meran, comfortable rooms & luxurious suites, adventure pool with sunbathing lawn, children’s pool & waterslide, indoor pool, whirlpool & sauna oasis. Welcome to Hotel Funggashof**** in Naturns! 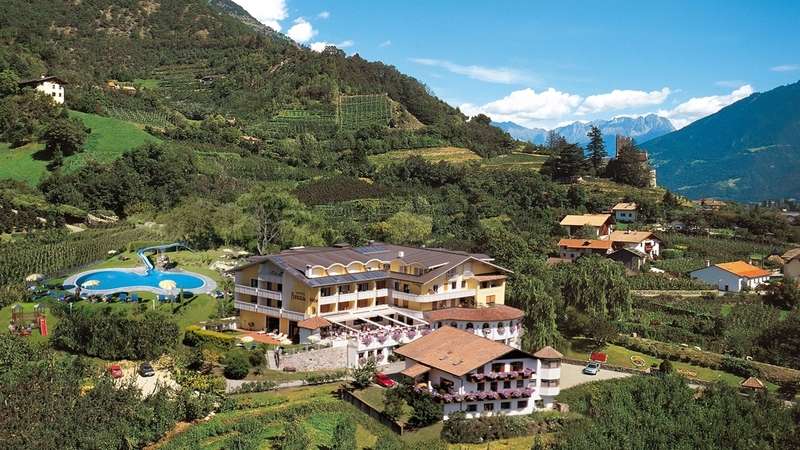 Our Hotel Funggashof**** is located in a really quiet and sunny position, not far from the spa town Meran. The hotel at the foot of the nature park Texelgruppe is the perfect accommodation for relaxing holidays in the wonderful nature of South Tyrol. The special atmosphere of our house energizes you and gives you vitality. We offer our guests cosy rooms and luxurious suites, which are furnished with every comfort. Some of the suites provide also a private whirl bath and a Turkish steam bath. The outdoor adventure pool with waterslide, lawn for sunbathing and kiddie pool as well as the indoor pool (30˚C) guarantee fun for the entire family. You will find pure relaxation in the sauna and beauty area with Biosauna, Venetian steam bath, Finnish sauna, infrared sauna, Tiepidarium, whirlpool and a varied programme with pleasant massages and treatments. The kitchen of our Hotel Funggashof pampers you with a rich breakfast every morning, a buffet with cakes, soups, salads and snacks in the afternoon and 5-7 course gourmet menus in the evening. The surroundings of Naturns are a paradise for activity holiday-makers. Discover the beautiful landscape during a hike, a bicycle tour or a mountain bike tour. The local tourist office provides a varied weekly programme. You can find also 2 golf clubs and many exciting leisure time activities nearby the hotel. Meran offers numerous shops, bars and museums.